The Philippines, with its 7, 107 islands, is the third largest English speaking country in the world, but Filipino is the national language. It has a rich history combining Asian, European and American influences. That’s why Filipinos are fun-loving people. Throughout the islands, there are fiestas celebrated every day and foreign guests are always welcome to their homes. There are 8 major dialects spoken by the Filipinos: Tagalog, Cebuano, Ilocano, Ilonggo, Bicol, Waray, Pampango and Pangasinense. But across the nation, there are total of more than 500 dialects, and about 76-78 major language groups. The country is marked by a true blend of cultures –truly in the Philippines – East meets West. Hospitality, being the best trait, makes these people legendary in Southeast Asia. Seldom can you find such hospitable people who enjoy the company of their Western visitors. Perhaps due to their long association with Spain, Filipinos are emotional and passionate about life in a way that seems more Latin than Asian. MANILA – the capital of the Philippines – its heart and soul, sets a rhythm of life in the archipelago and is a pulsating hub that blends the Oriental with the Occidental, the quaint with the modern, and the mundane with the extraordinary. CEBU – the gateway to a thousand journeys is a tropical islands with balmy weather, pristine beaches, crystalline waters, and luxurious resorts of modern living and islands perfect for divers. Famous for the Portuguese navigator Ferdinand Magellan who planted the Cross of Christianity in the name of Spain in 1521. PALAWAN – the last frontier, with bountiful resources, abundant wildlife and extraordinary natural beauty, it first attracted foreign attention in the 1970’s. As the old story goes, you can wake up to an amazing scenery of skyscraping dark cliffs, thick green forest, white sand beach, sparkling water and rising above it all, a magnificently sculpted jade islands. DAVAO – named as the Land of Plenty, best known for its “Kadayawan sa Dabaw”, its premier festival with the weeklong merrymaking highlights, capped by a flower and fruit float parade, and street dancing parade will complete the celebration. Major exporter of bananas, citrus and other tropical fruits. BORACAY – white beach is so, sooo fine, its feels like treading on miles of baby powder. A small island in the central Philippines, it is always included on the best islands of the world list, is shaped like a dog bone. It is 8km long, and 1km wide at its narrowest. The nightlife pulsates with many bars and restaurants serving food, drink and fun until the wee hours of dawn. BOHOL – a province in the Philippines, known for its coral reefs and unusual geological formations, notably the Chocolate Hills and the ever shy tarsiers, the world’s smallest primate, which occupy 134-hertares sanctuary. Fly to Vigan, The Old World City – the city retains much of the patina of the 18th century Castillan architecture as seen in some 150 stones houses which stand in the towns of Mestizo District, notably Mena Crisologo Street. It was once a royal city, to give honor of King Ferdinand. Many of these ancestral homes are still in good condition and some have been turned into cozy inns. Museums and souvenir shops. Explore Puerto Princesa Underground River in Palawan – part of the New 7 Wonders of Nature in the world, is a protected area of the Philippines located north from the city center of Puerto Princesa, Palawan. In 2010, a 2nd floor has been discovered in the underground river, a cave dome, more rock formations, large bats, deep water hole in the river, and more river channels. Trekking at Banaue Rice Terraces – dubbed as the “stairway to the sky” and described as “where land merges with the clouds to meet the heavens”, is a place for nature adventures and cultural immersion. These are terraces that were carved in to the mountains, by hands of the ancestors of the indigenous people. It is occasionally called as well the “Eight Wonder of the World”. Eavesdrop on the Mayon Volcano love story – an active volcano in the province of Albay, in Bicol which has the longest uninterrupted eruption lasted for 7 days in the whole town. As the folklore told, Magayon is an ancient beautiful princess who was forced to marry his wicked suitor, but Panganoron, Magayon’s true love, tried to rescue her during the day of the wedding. Both has tragical ending, Magayon was hit by an arrow, and Panganoron was stabbed to death. And on Magayon’s grave, a mound grew and it became the Mayon Volcano. 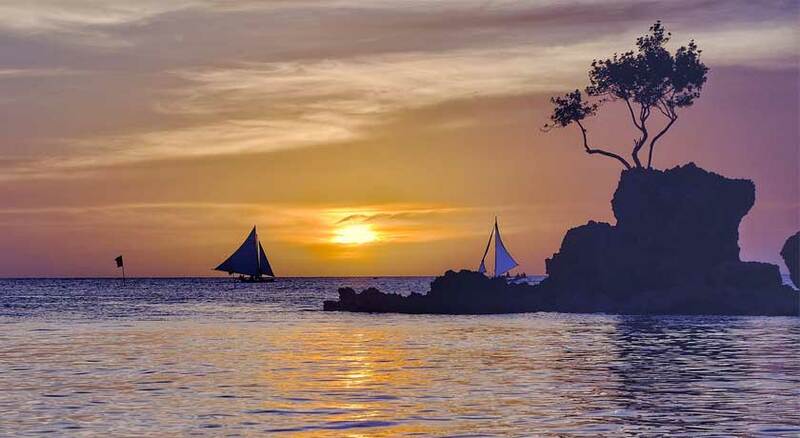 Spend Days in Boracay Island – with its sugary white sand beaches and azure blue waters, Boracay Island is the ultimate destination in the Philippines. The best of the island is the 4km white beach, touted as the “finest beach in the world”. The water surrounding the island is shallow and the fun is extremely until the sun comes up the next day. Drool over the Chocolate Hills – there are at least 1260 hills but may be as many as 1776 hills spread over an area of more than 50 square kilometers, which are covered in green grass that turns brown during the dry season. Romantically told, the handsome young giant, Arogo, who feel in love with a mortal woman died unexpectedly, the giant wept and his great teardrops turning into the Chocolate Hills. Hit the waves at Siargao Island - Siargao is home to the best surfing sites in the Philippines. With Cloud 9 ranked as one of the Top 10 waves in the world, surfers have been making the pilgrimage to the island to test their skill at the massive waves. Prime months are September-November. Cloud 9 is steep, fast, heavy and breaks over a shallow reef.